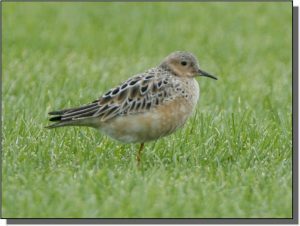 Description: This robin-sized sandpiper has bright, yellow legs and a short, black bill. It has dark patterning on its upperparts and a light strawcolored appearance to its underparts. Their eyes appear large and dark, isolated within buff-colored facial feathers, appearing rather “pigeon-headed.” They feed primarily in upland areas while making bobbing movements as they walk. In flight, white underwings with a dark wrist “comma” are visible. Similar Species: Buff-breasted Sandpipers are more compact than Upland Sandpipers and have proportionately shorter necks and legs, cleaner, buffy-colored faces, necks and chests and black bills. Comments: Male “buffies” gather on leks in the high arctic during the breeding season. They flash white underwings to females who have gathered to choose a mate. 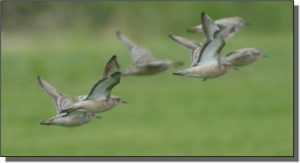 They are seen during spring and fall migrations within the Great Plains in short grass habitats such as sod farms, grazed pasture land, cut alfalfa fields and fallow fields. They spend their nonbreeding season on the short grasslands of southeastern South America.